Turkey’s economy is back in the news, and not in a good way. After last Summer’s foreign currency crisis, at the height of which the Turkish Lira had lost 45.6% of its value against the U.S. Dollar (from January 1 to August 14, 2018), the government was able to achieve some measure of stability, closing 2018 at a loss of “only” 28.5%. That, however, tells only part of the story. For months, ordinary Turks have been complaining bitterly about the rising cost of living, for which President Recep Tayyip Erdogan’s government has characteristically blamed sinister machinations by malevolent, primarily foreign, forces. Now, however, the Turkish Statistical Institute (TSI) has published a press release concerning Turkey’s economy during the final quarter of 2018, prompting heated debate and polemics between the government’s critics and its defenders. For all their passion, these debates fail to address the seriousness of the situation. A big dispute nowadays concerns whether or not Turkey has entered a recession. Perhaps it has, perhaps it has not. Given that Turkey’s legal system is in shambles, its politics border on the totalitarian, and the average citizen does not know what will befall him or her twenty-four hours from now, maybe this is an academic debate. But it can serve as a good starting point for a discussion of Turkey’s current situation. The generally accepted definition of an economic recession requires two consecutive quarters of falling Gross Domestic Product (GDP), that is to say, of economic contraction. By that criterion, Turkey is not currently experiencing a recession if one uses calendar-adjusted figures. During the fourth quarter of 2018, Turkey’s GDP declined by 3% compared to the same quarter of the previous year; during the third quarter, however, the GDP actually increased by 2.3%. Furthermore, the GDP increased by 2.6% over the entire year 2018. 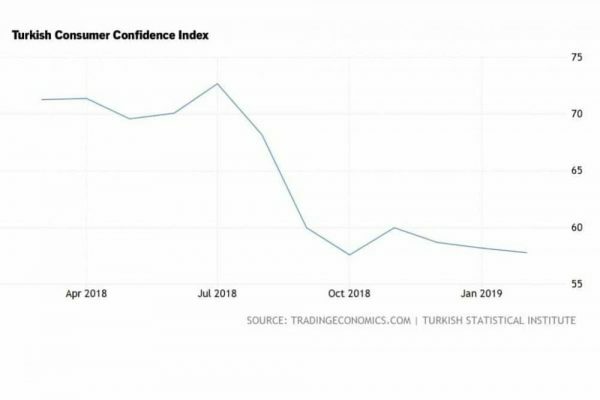 On the other hand, if one uses seasonally- and calendar-adjusted figures, then Turkey has indeed entered a recession, as the last two quarters of 2018 witnessed declines of 1.6% and 2.4%, respectively. How exactly the growth or shrinking of the GDP affects ordinary people is not immediately obvious, and the debate actually obscures the human dimension of Turkey’s current economic crisis. More apt questions to ask might be: Can ordinary people subsist on their income? Are households able to satisfy their needs for consumer goods? The latest figures released by the TSI enable us to give concrete answers to these questions, providing figures that shed light upon changes in the consumption patterns of Turkish households. The press release also provides information as to how the Gross Value Added (GVA) was shared by labor and capital. During 2018, the employees’ share was 33.9% against capital’s share of 48.7%. It is clear that this is hardly an equitable distribution of income. Dividing the latter by the former, one obtains a rough estimate of the rate of surplus value, an important distributional indicator used by radical economists; it is 144%! Despite this severely unequal distribution of income, high inflation, and the dramatic decline in the consumption capacity of households, the government nevertheless did everything it could to make life easier for businesses. For example, the press release indicates that government subsidies for businesses were systematically below taxes collected from them, so that net taxes in both 2017 and 2018 amounted to approximately -1% of the GVA. This betrays the government’s priorities, and explains in part why the people of Turkey should have no illusions as to the prosperity that Erdogan’s administration is likely to bring them. For much of the past decade, the ruling Justice and Development Party has sustained the illusion of creating wealth by investing in massive construction projects mainly financed by selling public property and borrowing on international markets. These projects filled the pockets of contractors close to the government, and some of the wealth did, of course, trickle down to the voters. Now, however, the chickens have come home to roost. Debts have piled up, the economy is in crisis, and the general public, as usual, is left holding the bag. It is not for nothing that President Erdogan has ratcheted up his bellicose rhetoric on the eve of the upcoming municipal elections. He must be feeling that the ground is slipping away from under him. This entry was posted on Monday, April 1st, 2019 at 00:05	and is filed under Uncategorized. You can follow any responses to this entry through the RSS 2.0 feed. Both comments and pings are currently closed.